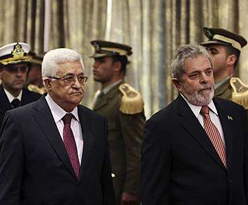 PA President Mahmoud Abbas and Brazilian leader Lula da Silva. Not only did the President of Brazil refuse to honour the ‘father of zion’ yesterday, he honoured the Palestinian people today by placing a wreath at Yasser Arafat’s grave in Ramallah. That was literally a ‘spit in the eye’ at the zionist occupiers. WE NEED MORE PRESIDENTS IN THE WORLD LIKE HIM! Brazil President meets with Abbas, lays wreath at Arafat’s grave after row over refusal to visit Herzl’s tomb. Several days into a visit to Israel and the Palestinian territories, Brazilian President Luiz Inacio Lula da Silva arrived Wednesday in Ramallah, where he expressed his support for Palestinian independence and for the creation of a Palestinian state. The Brazilian leader has said he would like to play a bigger role in Mideast diplomacy. He is visiting Israel and the Palestinian territories this week. Lula also visited the grave of late Palestinian leader Yasser Arafat, where he laid a wreath, despite criticism from Israel. There was no immediate Israeli reaction to the visit to Arafat’s grave. On Tuesday, Foreign Minister Avigdor Lieberman said he had boycotted meetings with Lula because the Brazilian leader did not visit the grave of the founder of modern Zionism, Theodor Herzl. Brazil’s president has criticised Israeli policies towards the Palestinians, warning that Israel’s separation barrier, its blockade of Gaza and its continued settlement building was extinguishing “the candle of hope”. Luiz Inacio Lula da Silva made his comments while on a visit to the West Bank where, on Wednesday, he placed a wreath on the tomb Yasser Arafat, the late Palestinian leader. What Lula terms his “mission of peace” began in Israel on Tuesday, and is the first visit by a sitting Brazilian president to Israel and the Palestinian territories. Brazil is Israel’s largest trading partner in Latin America, but it also has close ties to Iran and Lula has defended Iran’s nuclear ambitions, which Tehran says are peaceful but which Israel sees as a potential threat. Lula laid a yellow and green wreath on Arafat’s mausoleum in Ramallah and told a crowd of Palestinian officials and several dozen people waving Brazil’s flag that he had participated in pro-Palestinian protests in the past. Later Lula said that Brazil was willing to talk to Hamas, which is listed by the European Union and the US as a “terrorist” organisation. Lula’s comments are unlikely to have endeared him to Israel. A day earlier, Avigdor Lieberman, Israel’s foreign minister, said he had boycotted meetings with Lula because the Brazilian president did not pay a visit to the grave of Theodor Herzl, one of the founders of Zionism. Colin Harding, London-based a Latin America analyst, told Al Jazeera that Lula’s visit aimed at helping Brazil emerge as a bigger player on the world stage. “Brazil, under Lula, has been pressing very hard for a permanent seat on the Security Council of the United Nations, and if Brazil can intervene in some effective way in the Middle East crisis, this would clearly do Brazil’s chances no harm at all,” he said. Also visiting Palestinian leaders on Wednesday was Catherine Ashton, the European Union’s foreign policy chief, on the first leg of a two-day visit to the region. Like Lula, Ashton has criticised Israeli settlement building, telling Arab leaders in Cairo on Monday that the settlements threaten peace talks and are illegal. During a joint news conference in occupied Jerusalem with Lieberman, Ashton also called for the immediate resumption of peace talks. “I believe that it’s in the long term interest of this country that this government, together with the Palestinians, determine that future and the sooner we get to the talks, the better,” she said. She also said the so-called Quartet of Middle East negotiators would be “reinvigorated” in their efforts. She continued: “It’s difficult to say exactly how pressure on Israel might be exerted, it certainly wouldn’t be exerted in public press conference, it’s far more likely to go on behind the scenes. A Quartet meeting to be held in Moscow this week appears likely to be dominated by the issue of Israel’s settlement construction. Israel’s continued settlement building has caused a crisis Israel relations with the US after Israel unveiled plans to construct 1,600 new homes on occupied Palestinian land during a visit by Joesph Biden, the US vice-president.